Over the years Bali has become a popular tourist destination and it seems like everyone knows someone who has been there at least once. There’s a reason for this, it’s because Bali is incredible. Offering one beautiful beach, waterfall, rice field, volcano, and temple after another. This is a place we could return to several more times, even though we’ve already been twice, and still find new places to discover. Because Bali is so popular, you can imagine that there are some super touristy areas that are beautiful but come with crowds. 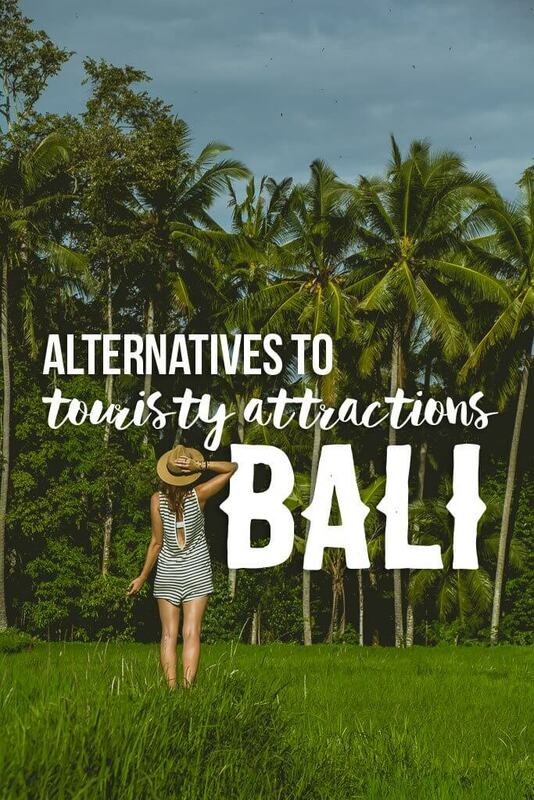 If you’re not a fan of overcrowded attractions then you’ll be happy to know there are alternatives to the most touristy attractions in Bali. Enjoy the beauty of this Indonesian charm without the huge crowds. 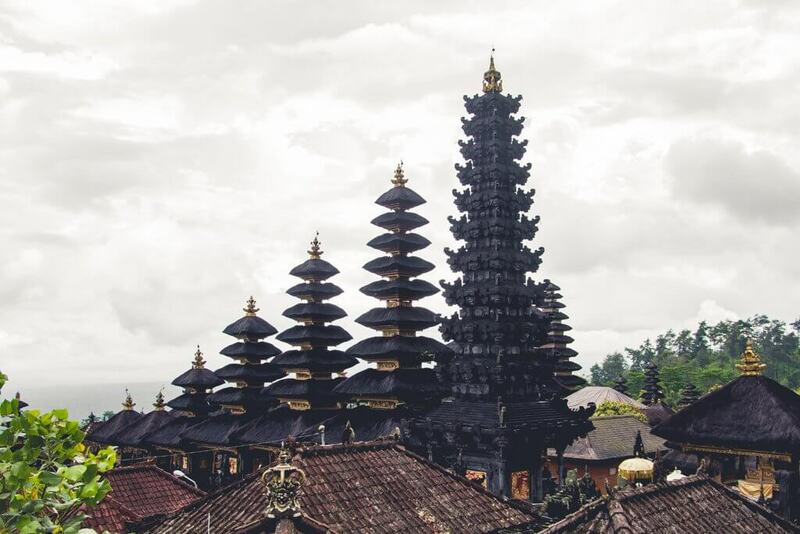 Besakih is the mother of all temples in Bali and worth visiting even if it is the most visited temple by travelers. Located on the most sacred of volcanos on the island, Mt. 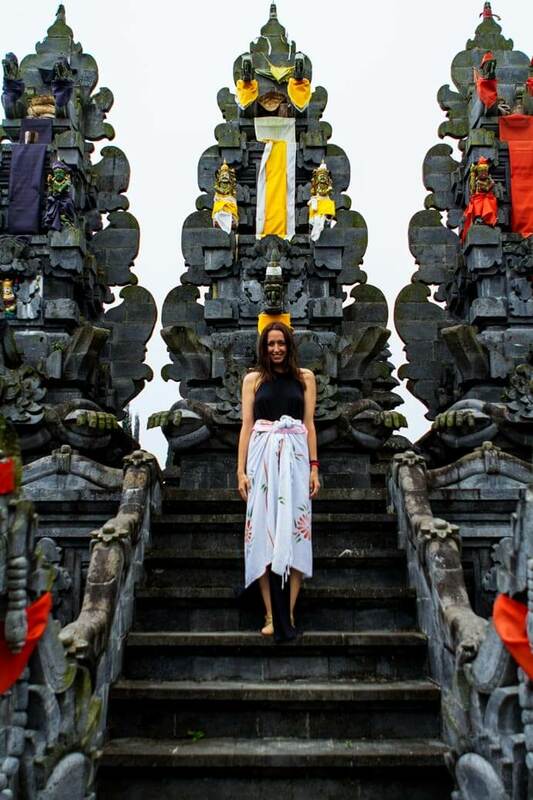 Agung, Besakih is loaded with at least 30 different temples and sloping levels up the volcano. 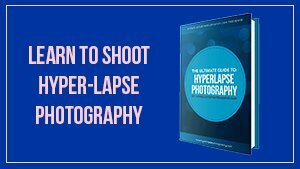 This entire complex is a photographer’s playground. Because of Besakih’s fame, you can expect lots of tour buses and other admirers exploring the temple’s grounds. We were barely bothered by the crowds as the complex is so large. What did bother us would be the touts and scammers that hang out here. Be prepared to be told you need a guide to look through the temple. 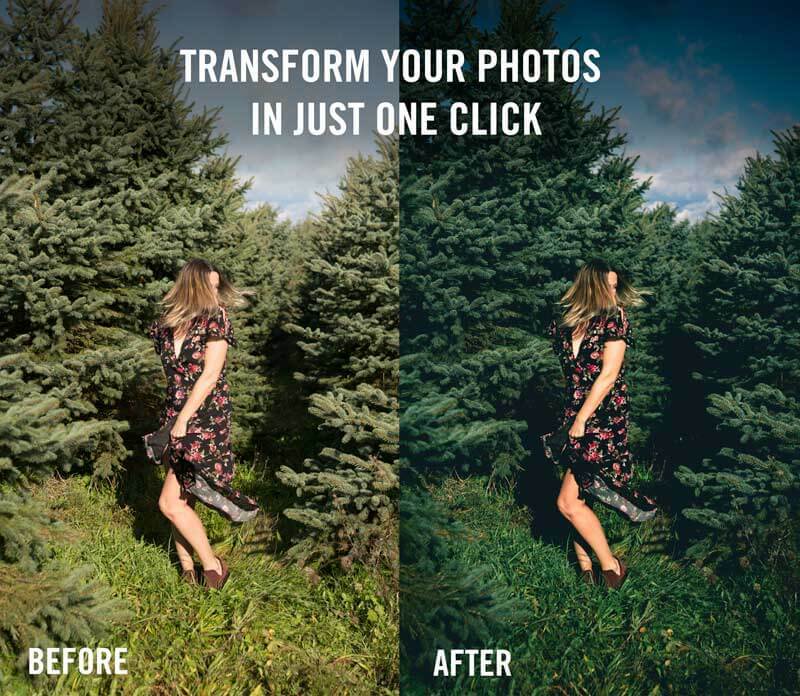 This is not true. You are able to walk through and enjoy the temple, all except for the main area on the top of the main Pura Panataran Agung gates. The touts will not leave you alone and try to convince you that you need a guide. This is just one of the several scams reported here which make for grumpy and disgruntled tourists that share their experiences on places like TripAdvisor. This can get rather annoying, especially if you’re not expecting it before arriving. 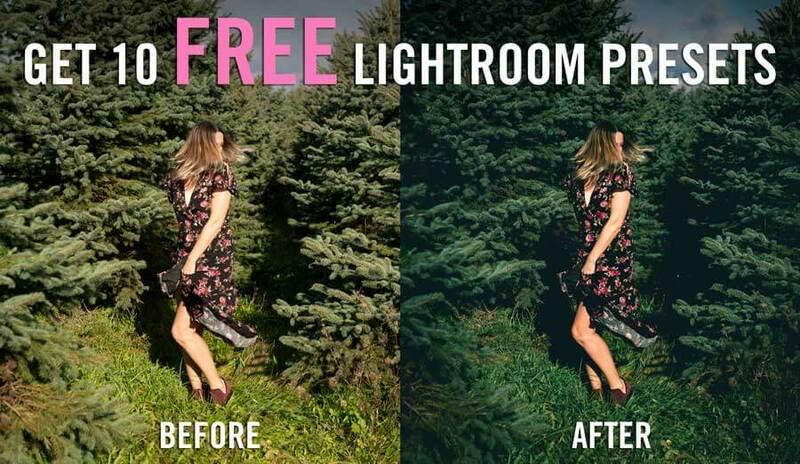 If this is something that will absolutely ruin your experience we recommend visiting a different, less popular temple. After all, this is one of the most touristy attractions in Bali, so you will see more of this in areas where more travelers visit. *Make sure you are aware that men and women both have to wear sarongs to enter Besakih. You can buy them for just a few dollars outside the temple or rent them for dirt cheap. Not to be confused with the gorgeous Ulun Danu Bratan water temple, another beautiful but touristy attraction in Bali. Ulun Danu Batur is best combined with a visit to Mt. 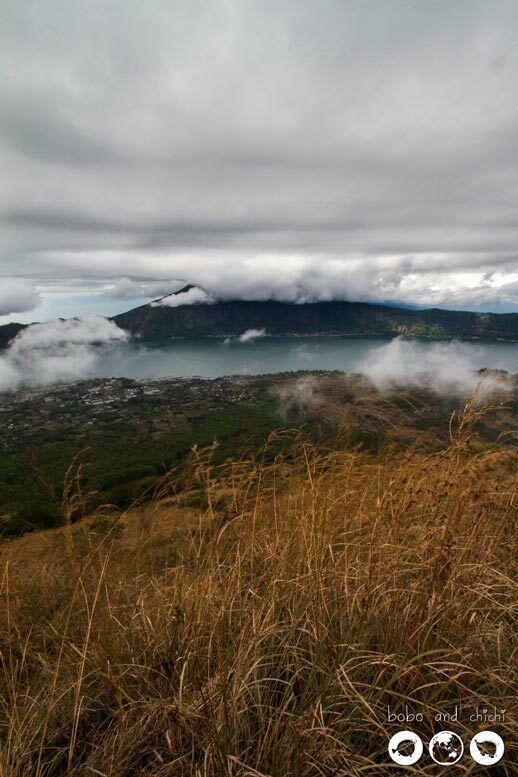 Batur, the popular sunrise volcano hike! 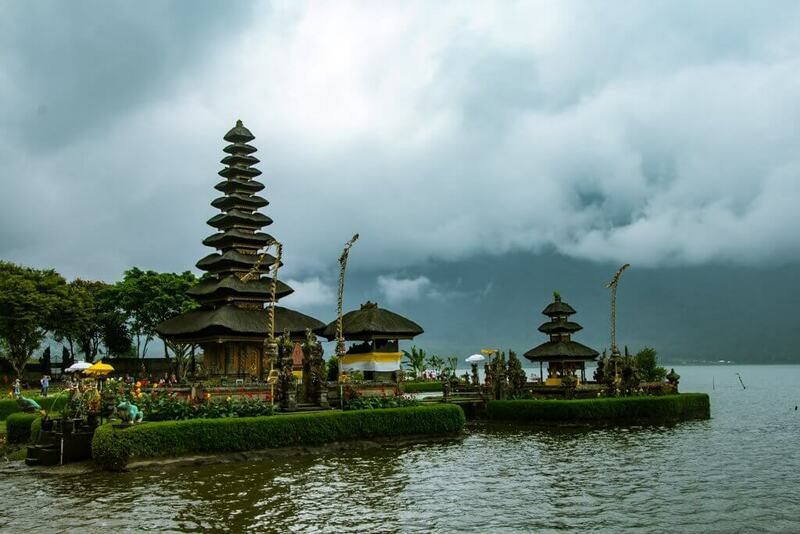 Ulun Danu Batur is the second holiest temple on the island behind Besakih as it’s also located on sacred grounds, Mt. Batur Volcano. Pura Ulun Danu Bratan, another gorgeous but crowded temple in Bali. Although this temple lacks in size compared to Besakih, it’s still a gorgeous place to walk around and take photos with fewer crowds. Again, be prepared to run into some touts, but not nearly as overwhelming as Besakih. 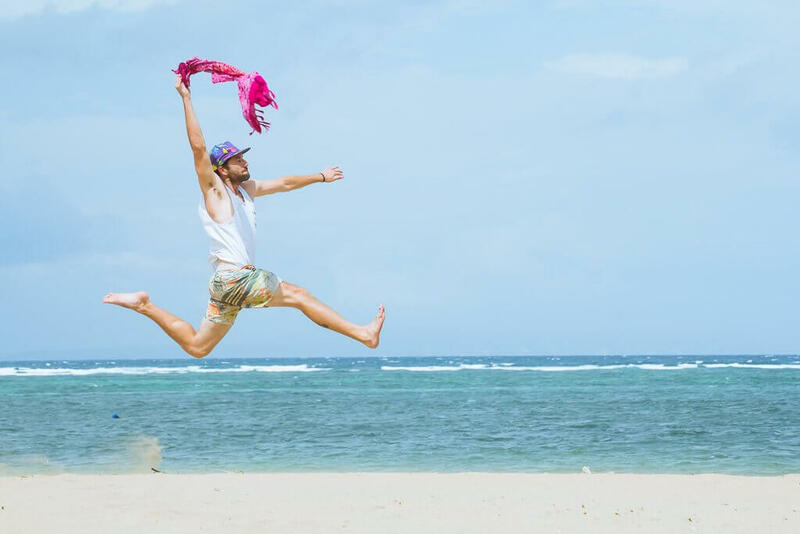 Again, you will need to make sure you have a sarong for both men and women, if not you can rent or purchase one here on arrival. 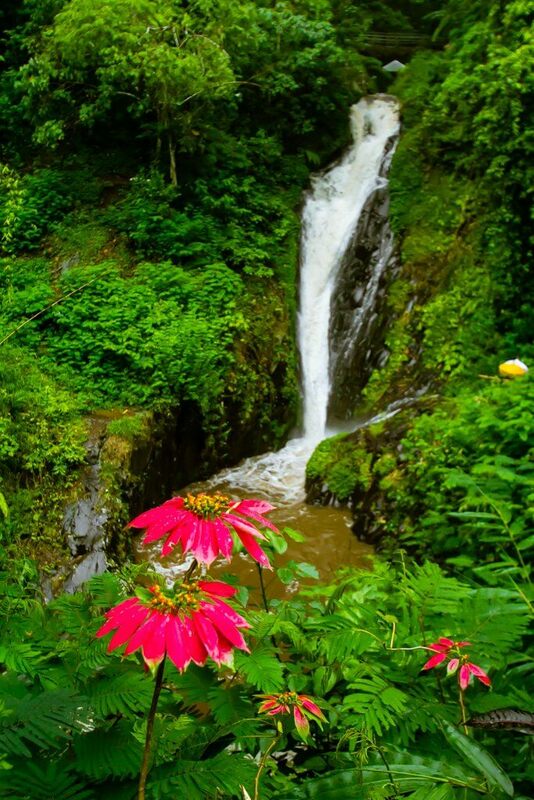 This alluring waterfall has to be the most popular falls on the island due to it’s close proximity to Denpasar. This is the only waterfall that is not located in the highlands or mountains on all of Bali. Climb down the hundreds of stairs and soak in the view. Tegenungan Waterfall is a sight to see but it does come with a rather large crowd! If you’re patient enough you may be able to snap a photo without other tourists in it. Another spectacular waterfall and considered the best one on the island by locals is Gitgit Waterfall. There’s no crowd here which seems strange considering it’s local title, but once you drive there you may understand why not as many people make it to Gitgit! The drive itself is at least two hours away if you’re staying in Ubud, but well worth the drive. You actually get to see three different waterfalls at Gitgit. 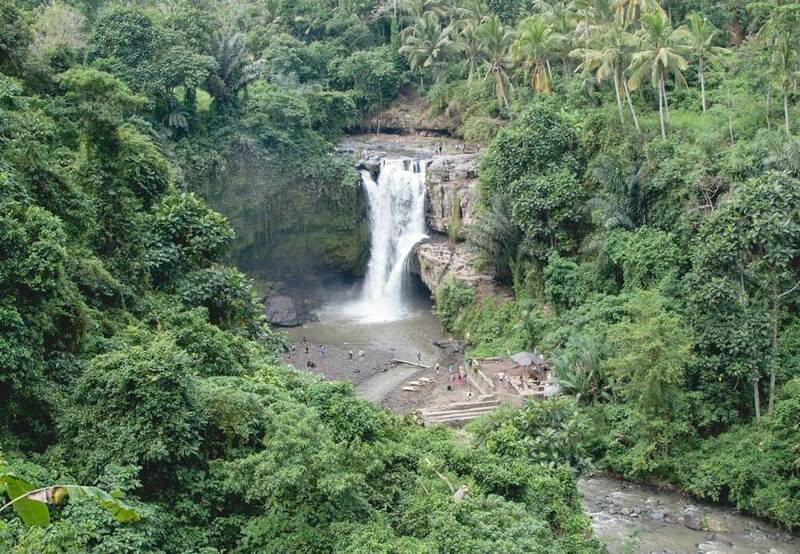 The most popular would be the Gitgit Twin Falls, aka Waterfall Campuhan. The two twin falls join together in a pool of fast current water below unsafe for swimming. Even though you can’t cool off here, it’s a breathtaking view. Wander on to the second waterfall, Mekalongan Falls, just a few steps away from the Twin Falls. The water for this drop is the same water source for Gitgit and is a bit taller. The third waterfall, Waterfall Terraced, is one you can see on your walk to the first and second falls and is just another short walk away. During our visit, we were the only people at the waterfall beside one other couple and locals who live here. Even though we couldn’t swim, this was the best waterfall experience we could have hoped for at a popular place like Bali. You’ll easily be able to capture great photos without other tourists photobombing you! Visiting rice terraces are a must while traveling through Bali. The mountainsides full of green lined rice paddies is full of unrivaled beauty. 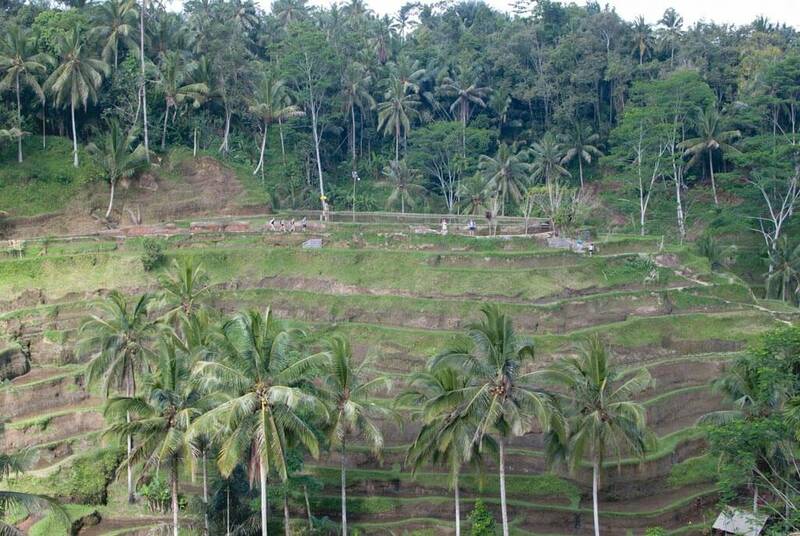 Tegalalang Rice Terraces is one of the most touristy attractions in Bali you’re bound to pass through. These are the most popular rice paddies to visit on the island, and it’s no wonder why. Not only is Tegalalang conveniently located just outside of Ubud, but it’s on the way to many other tourist attractions on the island. Tegalalang has been visited by so many tourists over the years and just seems to get more and more popular. You will find that the locals have catered to the dense crowds of tourists by having tons of shops and places to eat strung along the fields. Visiting Tegalalang is great if you’re short on time since you can knock out a ton of places in one day since you’ll most likely be passing through. 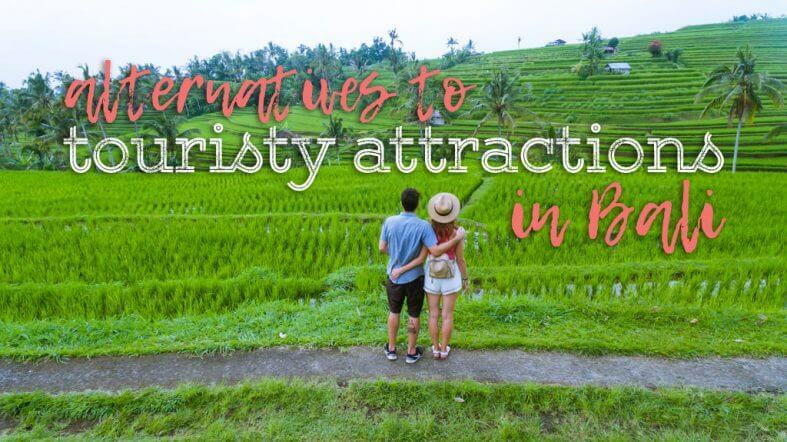 But if you have more time on the island and want to get away from the crowds then we urge you to check out one of the other alternative rice terraces on the island. 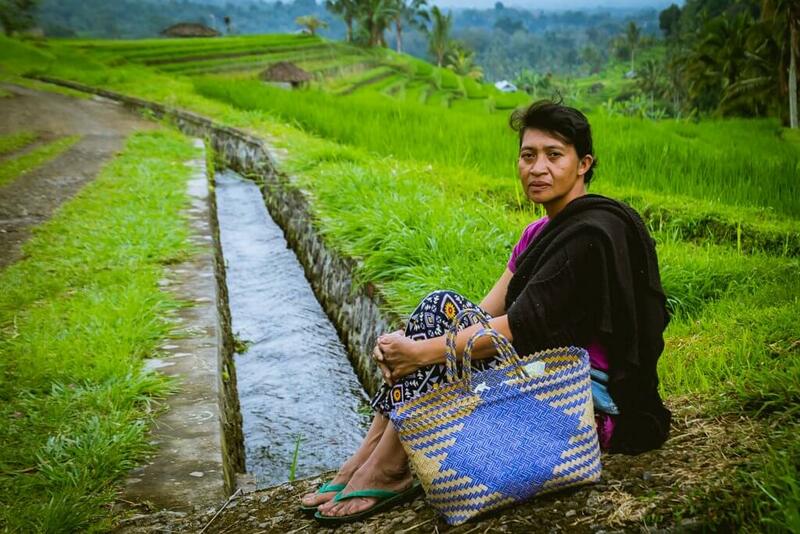 To see more rice terraces and fewer people, head to the more rural rice paddies of Jatiluwih. The rice terraces here seem to never end and you could easily explore the trails here through the mountains overlooking the lush green landscape an entire day. We really couldn’t believe how far away from everyone else seemed while we were here. It’s getting harder and harder to find a place all to yourself in Bali, but this is one of them. You’re just a few minutes walk away from being in complete solitude if you find yourself near someone. The only people we saw here were a few field workers waiting for a ride to go home and less than a handful of tourists. We felt like we got to see more of an authentic Indonesian rural area to admire. One without stand after stand selling Bintang tank tops and elephant pants. What makes Jatiluwih even more special is that it’s a UNESCO heritage site as well. 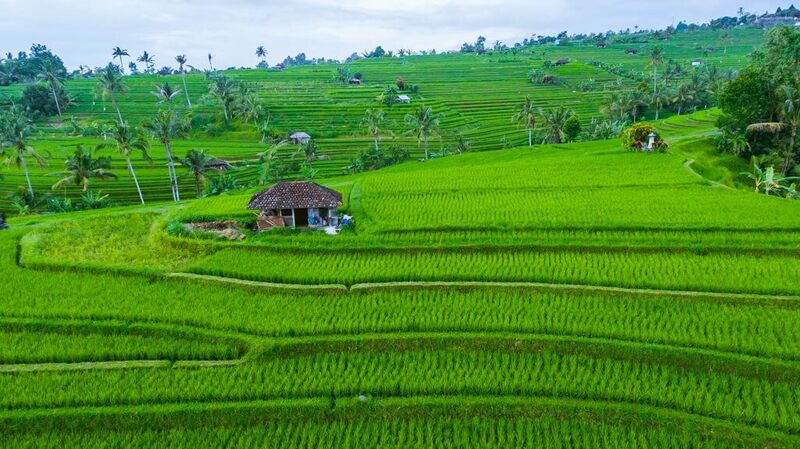 It just makes us wonder why more people don’t visit these rice fields instead! The mother of all beaches in Bali is Kuta Beach. Popular with tourists for years and lined with resorts this is the place to go to if you’re really short on time or prefer staying somewhere where your centrally located to the airport, beaches, and city. Kuta is also popular among surfers making it another reason why this is a tourist hotspot. This area is great for luxury villas like Samabe. Some travelers either love or hate Kuta. We are indifferent, we think it’s great for families traveling with kids who want convenience or surfers who are visiting to do nothing but ride waves. But for those looking for peace and quiet may want to consider finding a more secluded resort like Samabe Villas or move to a less crowded area on the island all together. 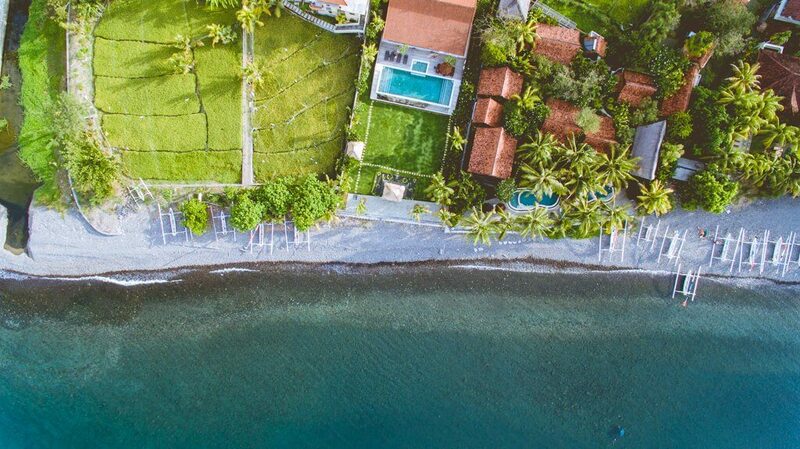 If you want to remove yourself from all crowds yet still have excellent options for dining, accommodation, and water activities then you may want to consider visiting Amed Beach. This quiet fisherman village is slowly getting more and more popular for its reputation for being the place to go to for peace and quiet with great snorkeling and diving options. The food here also has its own reputation with some of the freshest seafood on the island. There are tons of options for hotels, resorts, and guesthouses for all budgets right on the beach. Some even offer yoga retreats. To us, that’s a real win, win. Another quality that draws people to Amed would be it’s gorgeous black sand beaches. The black sand comes from Agung Volcano which can be viewed from about anywhere in Amed and offers some epic sunsets unlike anywhere else on the island. For divers and snorkelers, there are two different shipwrecks to explore and tons of reefs for you to enjoy. Check out our guide to Amed here. The most popular and the easiest climb on the island is Mt. Batur. Famous for it’s epic sunrise trek, this is an experience that you must do if you love gorgeous, panoramic views which is probably why it’s one of the most touristy attractions in Bali. It’s almost always required to go with a group or get a guide take you up the volcano in the wee hours of the morning where you will stand on the top waiting for the sun to rise and waiting for your breakfast eggs to cook in the volcanic steam. If you don’t have a guide you may be harassed by the locals in Kintamani who will try to tell you otherwise. They are harmless but will try to convince you that it’s impossible without a guide and also get a little pushy. Even if you have to share this experience with a bunch of other people, it’s still worth it. Another volcano climb that starts in the wee hours of the morning and not for the faint of heart. Start your ascent at 2:30 am and be prepared to huff and puff up unless you’re in excellent physical shape. Mt. Agung is known to be a much more difficult volcano to climb than the more popular Mt. Batur, which is probably why fewer people do it. Start your trek through the dark forest with your headlamp and be prepared to hike two to four hours to the summit for the sunrise where you may be the only people there to witness it! The way back down is known to be more intense, so be prepared with plenty of water. If you physically can’t do the climb at Mt. 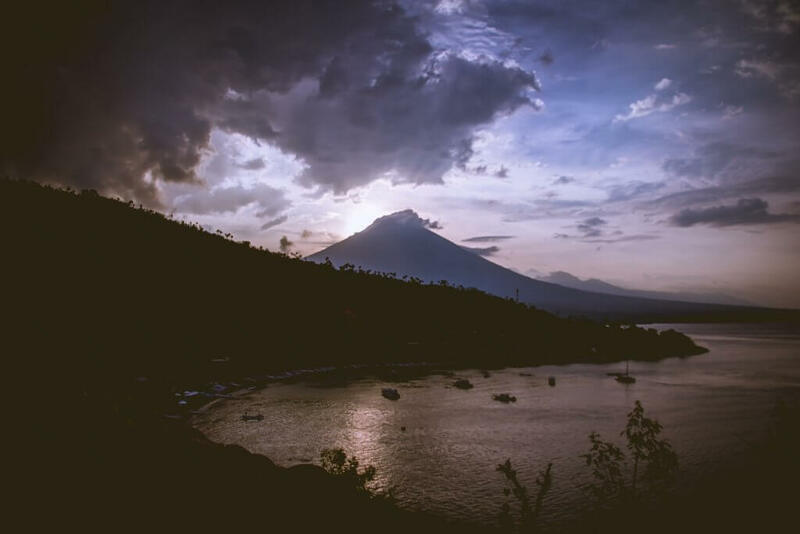 Agung, you can still enjoy amazing views and a great sunset from Amed. There you have it! Here are the top alternatives to touristy attractions in Bali. Even if you do end up doing the touristy things, there’s nothing wrong with that. Bali is beautiful no matter how you decide to travel there. 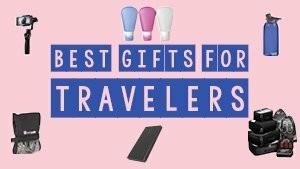 Have any other recommendations or hidden gems on Bali? Share it in the comments below! We would love to hear all about it! Indonesia has alot more to offer beyond Bali by the way, check out more incredible Indonesian beaches to visit. Sharing is caring, share this post so others can find these fun tips on Pinterest!